December 2008: John Fair sent us this clipping from the Sunderland Echo. The following material was kindly provided to us by Roger Smith, who worked with Nigel in the mid-'60s. Go see his excellent website Ready Steady Gone for even more info. Nigel on drums, and Jimmy Hall on keyboards. "Some band history: Nigel left his first band, The Fireflies at the end of April 1965 and formed a band with Mick Grabham called The Fallouts. Mick had also previously played with the Fireflies. 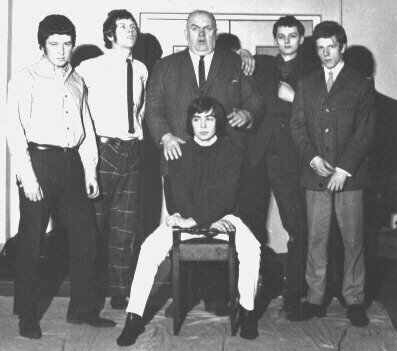 The Fallouts changed their name to Jazzboard in August 1965 and around this time Mick Grabham left, possibly to try his luck as a musician in London. 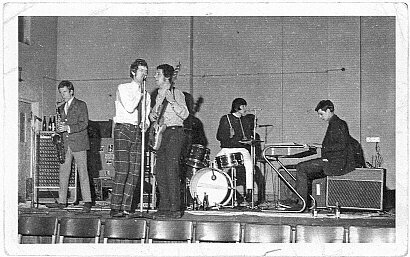 When I joined the band on tenor sax at the end of September 1965 they were a four-piece blues bandkeyboards, bass, vocal with Nigel on drums. The singer Bruce Lowes also doubled on drums and Nigel fronted the band on vocals for a couple of numbers. The fact that we didn't have a lead guitar made us a bit different. 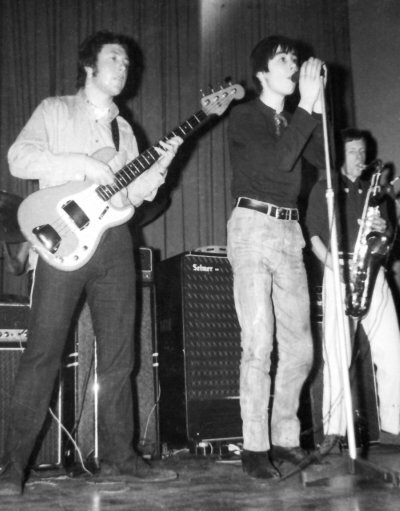 Our main influence was a British R&B band named the Graham Bond Organisation which had the same line-up as us and featured the musicians�Jack Bruce and Ginger Baker (who later formed Cream with Eric Clapton). We had a big following in the Sunderland/Newcastle area at the time. Nigel's looks and charisma had a lot to do with our success. Over the following year we played on average three or four nights a week at local venues. We all had daytime jobs, on and off. I recall that during one period Nigel was working on the tugboats in Sunderland Harbour. We had to miss a couple of gigs because he had to work night shifts! In 1966 we opened for some of the top British bands of the eraThe Who on 7/1/66, The Small Faces on 8/2/66, Geno Washington on 15/4/66, Jerry Lee Lewis on 24/10/66 and Cream on 13/11/66. When we played on the same bill as The Who at the McCoy Club in Middlesbrough, Nigel struck up a friendship with the late Keith Moon. Nigel left the Jazzboard in the Spring of 1967 to form another band whose name I can't recall. Jazzboard carried on without him for a few months as a 6-piece and then a 7-piece but folded at the end of August 1967.� The following month, 4 members of the original Jazzboard (Jim Hallkeyboards, Brian Hughesbass, Nigel and myself) formed the James South Syndicate, a 7-piece soul band. Our last gig was just before Christmas 1967. A couple of days later, Nigel left for London to join Plastic Penny with Mick Grabham. The Plastic Penny single "Everything I Am" was recorded using session musicians. By Christmas of that year the single was racing up the charts. A band had to be put together very quickly for a TV appearance on Boxing Day. This was the break that Nigel was waiting for and which took him from being an unknown drummer in Northeast of England to the top of his profession. I have a recording of the Jazzboard made on 27 March 1966 at a small studio in Newcastle. Nigel sings lead vocals on one of the four tracksa song called "Hear Me Calling Your Name", originally recorded by Cream with vocals by Jack Bruce. The other three tracks are "Mr Pitiful" (Otis Redding), "Neighbour, Neighbour" (Jimmy Hughes) and "Feel It" (Jazzboard composition), all of which feature Nigel on drums and backing vocals. Great web site, by the way."